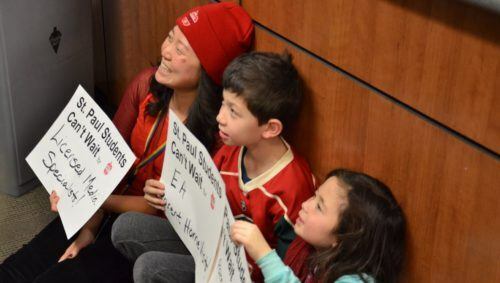 Members and their families rallied at the school board in 2015. Toward the end of negotiations, members, parents, and community allies rallied at the district office for a contract settlement. 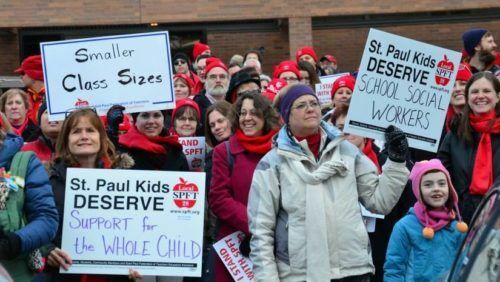 The Saint Paul Federation of Teachers bargains contracts for all School and Community Service Professionals, Educational Assistants, and Teachers and other licensed staff who work in Saint Paul Public Schools. SPFT is proud of our long history fighting for the best contract possible for our members. 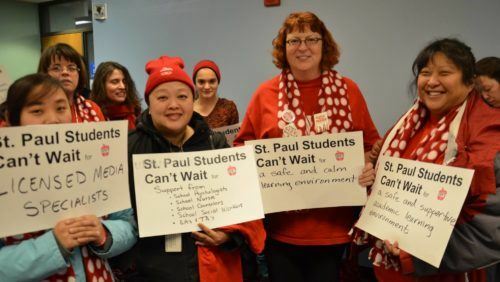 Negotiations for the 2017-19 contract concluded on February 25, 2018, when SPFT members officially voted to approve contracts for our SCSPs, EAs, and Teachers. You can find details of those contract agreements here. Contract negotiations will begin again in the 2019-20 school year. Our negotiation sessions are open to the public, and we encourage members, parents, and community members to attend. Educators and parents are key partners in contract negotiations, and we often invite them to testify on the proposals we are bringing to the bargaining table. Bargaining alongside parents and the community fundamentally changed the way that SPFT approaches contract negotiations.